You’ve heard about the Berlin Airlift, the mammoth air freight service that sustained the citizens of West Berlin through a Cold War blockade in 1948-49. This is the story of the Brantford airlift, a considerably more modest, but nevertheless remarkable, logistical undertaking that shepherds precious cargo — 50 to 60 Ontario special needs kids — to and from their schools and homes every weekend. Aircraft lined up on the Brantford ramp, awaiting their cargo of children for transport. Note the sign in the foreground, indicating route of that particular aircraft. It begins, like clockwork, each and every Friday, when four Bearskin Airlines Fairchild Metroliners shoot the approach for 05/23 at Brantford Municipal Airport (CYFD) and touch down around noon. The airplanes are promptly met by YFD staff, marshalled into a smart line on the ramp, serviced and fuelled. While their pilots talk shop and nosh a quick bite at the airport’s restaurant, the children begin to arrive. The children hail from all over the province and are the raison d’etre of the Ontario Ministry of Education’s Provincial Schools Branch: eight boarding schools set up around the province whose mandate is to educate students who are either deaf, blind or who have learning disabilities. It’s more cost effective for the province to fly students to and from centralized schools than to build schools in each community. Hence the airlift. Brantford happens to be home to one of those schools — the W. Ross Macdonald School for students who are visually impaired, blind and deafblind. Brantford airport is the conduit allowing its students to get to class and maintain contact with their families. 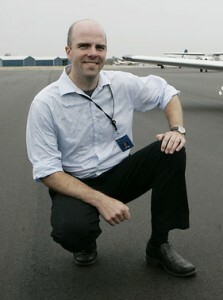 Mark Culshaw, general manager of the Brantford Municipal Airport. “It’s a remarkable program and we’re delighted to play a part,” says airport general manager Mark Culshaw. “A lot of people know about the Ross Mcdonald school, but they may not know how aviation fits into what it does”. The logistics of the program are managed and coordinated by Skyservice, the charter airline and aircraft management company. 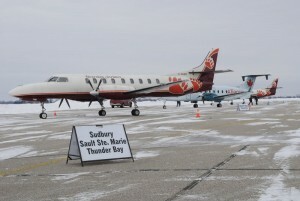 Skyservice, which has one employee dedicated full time to the program, subcontracts the actual flying to Bearskin, whose Metroliners criss-cross Ontario with scheduled service each day. (bearing360.ca contacted Skyservice for comment but they stated that terms of their contract with the province prevent them from speaking about it; the Ministry of Education also declined comment). The children arrive with guides and they and two Brantford airport staffers help ensure the proper kids get on the right aircraft. Each Metroliner (pressurized turboprops that seat up to 19), has a unique routing depending on the children involved each school term. Generally, one aircraft goes to Ottawa, one to Pembroke-North Bay-Timmins, one to Sudbury and a fourth goes to Sault Ste. Marie and Thunder Bay. The Ottawa flight picks passengers up in Ottawa, flies them into Pearson (CYYZ), where they connect to an Air Canada Jazz flight to Windsor. On Sunday evening, the Metroliners once again spool up their engines, take to the sky, and the process is reversed as the kids travel from their homes back to their respective schools. Brantford is something of hub for the program, with kids transferring to and from different aircraft. “We do everything we can to ensure it all goes as smoothly as possible,” Culshaw says. The program, says Culshaw, is one of the airport’s most important, generating economic activity in the form of landing fees, fuel and services worth $55,000 per year. But it’s the frequent fliers carried by those Bearskin airplanes that fills Culshaw and his staff with a sense of mission and accomplishment. This entry was posted in Airports, Heart-Stopping Stories and tagged Bearskin, blind, Brantford, children, CYFD, deaf, Metroliner, Ministry of Education, Ontario, Provincial Schools, school, Skyservice, W. Ross Macdonald on January 21, 2013 by Craig Daniels.